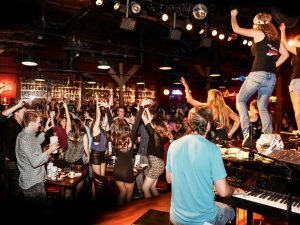 The Gaslamp Quarter is known to many as the lively downtown neighborhood with a thriving nightlife. But have you ever decided to spend the whole day in the bustling district? Whether you’re visiting yourself, entertaining a friend from out of town or maybe you have the day off of work and you just want to spend a day exploring one of San Diego’s most unique and vibrant neighborhoods, we’ve got the perfect plan for you! You wake up early for your jam-packed day and decide you want to get in a workout before hitting up the town. Lucky for you, the Gaslamp District is right next to the bay. 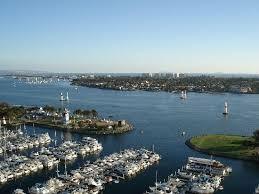 You start your day off with a run around San Diego’s most scenic bay view. As the sun begins to rise high in the sky, the bay breeze keeps you cool enough to run for miles! You start at the Convention Center and jog through the Embarcadero, Seaport Village all the way up to the Martimite Museum and back! You’ve stopped along the way to snap a few selfies and landscape photos of the blue water, but now that you’re done… you have definitely worked up an appetite. You pull your car into the Horton Plaza Parking lot* and decide to walk around Gaslamp for the day. You know that you should eat something a little healthier, but you’re seriously craving Brunch food. The only thing is, it’s not a Sunday. You decide on a classic breakfast favorite: Old-Fashioned Pancakes. 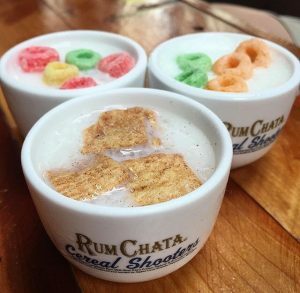 To spice things up, you order a couple of signature “Breakfast Shots” served at Garage Kitchen + Bar. The perfect way to reminisce about childhood favorites with an adult twist! 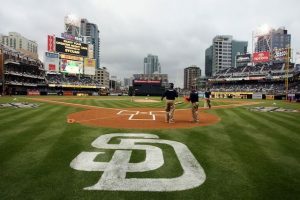 You mention to your server that you are attending a Padres game, and you get 10% off your tab! ** Go Padres! The sun is shining and you want to keep the party going, so you decide to get some food and drinks. Our recommendations: local craft beer and a classic hot dog! You can’t beat the classic, all American experience of Baseball, a hot dog, and San Diego beer. The San Diego Padres have scored a victory and you’re feeling good! You want to hit up a happy hour and keep exploring this awesome city! You had such a great time at Garage Kitchen + Bar that you decide to head back over. It’s 51% Off from 4-7pm every day! 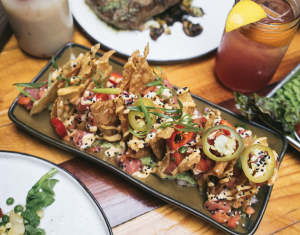 You decide on their signature Ahi Tartare “Nachos” and a house cocktail. As you chow down on wonton crisps, ahi tuna, avocado and an edamame puree, you meet some new friends and keep the good times rolling! After some more drinks and food split between friends, happy hour starts to dwindle down and you’re not hungry enough for a full dinner, but you also don’t want to go home quite yet. You exit Garage Kitchen + Bar and walk right past the Shout! House. As you peer through the window, you see a large crowded room with people singing and cheering all around. 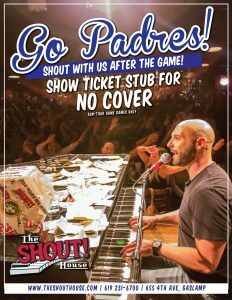 You ask the bouncer how much the cover is, and he tells you that with your Padres ticket stub there is no cover. Go Padres (again)! The Shout! House has been a staple in the Gaslamp Quarter for 14 years. As you settle in after grabbing a drink, you soon realize why this place is so packed. There are two dueling piano players taking song requests and playing them in the most entertaining way! It’s the great music hits of all time combined with showmanship, energy, and comedy. You put in a song request and get to dance up on stage next to the Piano Players as all of your friends record you on Snapchat and Instagram… you can thank them later. You end up staying until closing time at 2:00 am. What a day! You tried different food, learned about Gaslamp’s history, celebrated a Padres win, and danced it out at the Shout! House. You’ll have memories – and thanks to your friends – lots of video footage to share with everyone! The Shout! House is open seven nights a week! To make a reservation, click here! **With valid same-day ticket stub. 10% Off Promotion not valid during Happy Hour.